Yesterday we spent the day running some errands, taking care of some other things and today focused on the decorations. Was able to get everything done and set up. Happy with the tree. We went for white lights this year and put up a combination of our and Kristina's decorations on the tree. Came out pretty. 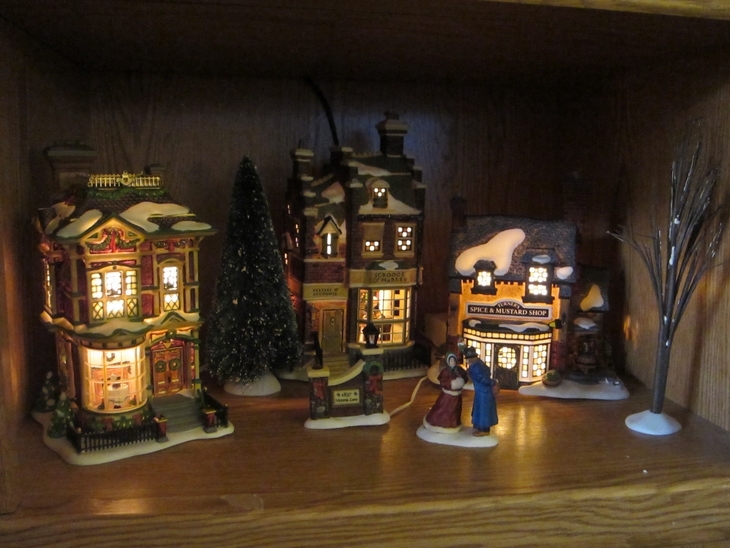 Click here if you want to see a picture of my little Christmas village. Also all done with my Christmas shopping for the most part. Just need to pick up a couple gift cards and also need to wrap everything. But I am hesitant to put anything under the tree with all the cats around so the wrapping might not happen until Christmas Eve. We will see. What are everyone's plans for Christmas and New Year's? We will be spending New Year's at a bed and breakfast in Portsmouth, New Hampshire. Not sure about Christmas. We will definitely be home in the morning opening our gifts with Mike's sister and kids. Will figure out the rest of the day later.